Kickstarter project – nearly LIVE! Its nearly ready! Hopefully, Monday 1st July is the day we aim to set off our Kickstarter project to raise funds for the next episode of the Bald Explorer programme. This new series is looking at Britain’s hidden heritage. As you now I aim to visit a number of towns in the UK and find the interesting stories and historic places of interest and wrap them into a series an interesting TV programmes. 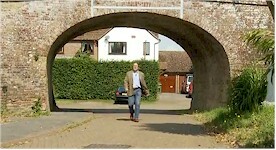 My son, Billy and I, drove to Yapton in West Sussex to film the pitch video for the Kickstarter project. Sitting there is the Tack Lee Bridge, one of the last remnants of the Portsmouth to Arundel Canal; it stands now in a modern housing estate. The canal no longer flows underneath the bridge as it was abandoned and filled in many years ago, although you can still follow the path of it on the ground for quite some stretch; it is no more than a dry ditch filled with stinging nettles, but much is accessible and it sure makes for a good countryside walk. The canal originally was built as a means for goods to be transported from the Portsmouth docks to London. Barges would travel along the south coast to via this navigation to the River Arun in Sussex, then through the Arun and Wey canal, along the River Wey and until they finally joined the Thames, and hence to London. Gold bullion was famously transported along this route so as to avoid shipping it through the English Channel, where it was prone to pirates, or worse, the French! It was a doomed canal, however, as the railways were only thirty years away. It was finally opened in 1823 and consequently, it never made a profit. Sadly, it is far too long gone nowadays to save it or return it to water. Tack Lee Bridge, Yapton in West Sussex. For me there is great pleasure is stumbling across these ancient relics of the past and then finding out their stories and sharing my discover and enthusiasm with others. The bridge reminds us of the existence of the canal, which without it I fear the owners of the houses built around would have been ignorant. I am sure that it also increases the value of their properties. I do hope you will support the Kickastarter project when it goes live and help me make more episodes that explore this wonderful nation’s past.